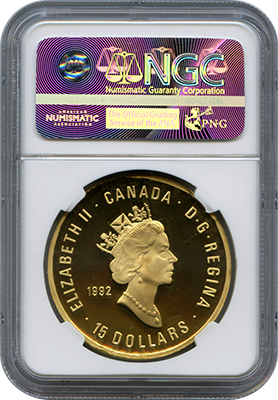 This is one of the rarest, most expensive and spectacular Canadian mint error coins known. 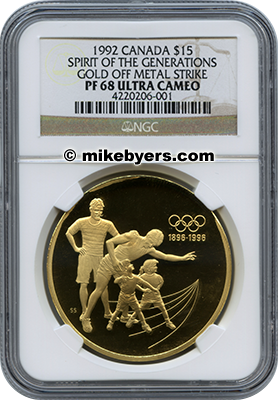 This proof gold off-metal mint error was certified and authenticated by NGC. It was struck on a $50 Gold Planchet that was intended for a 1 oz Maple Leaf gold coin. It is the size of a U.S. Silver American Eagle and is in superb proof cameo condition. 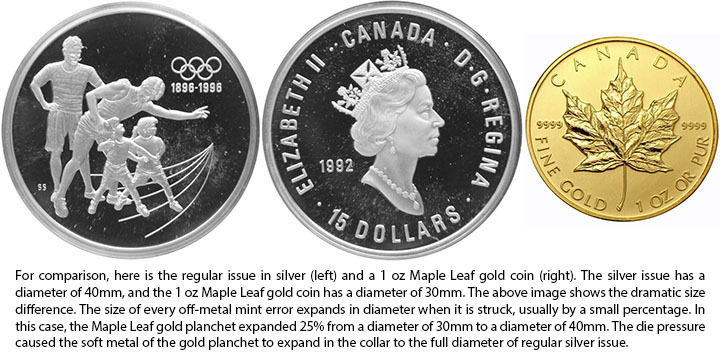 The diameter of a regular 1 oz Maple Leaf gold coin is 30mm and it has a thickness of 2.8mm. This gold off-metal mint error expanded to a diameter of 40mm when it was struck. 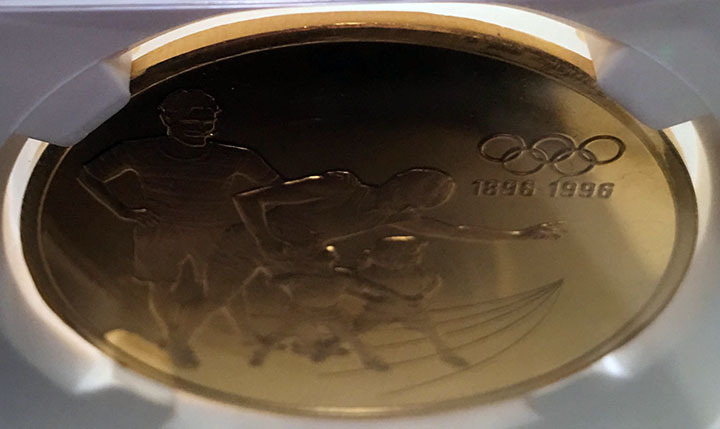 There are only three known examples of this rare proof gold off-metal in the last 27 years. 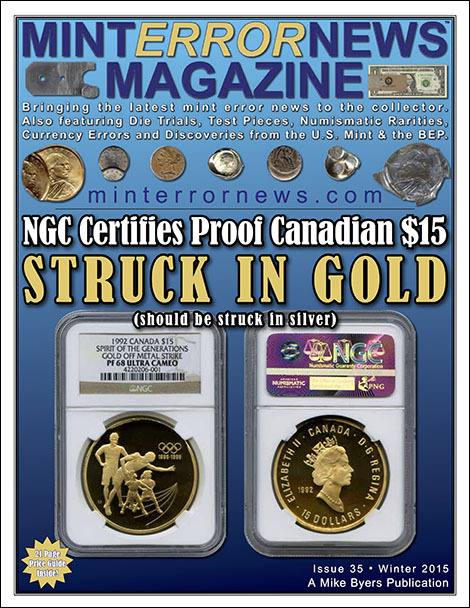 One was authenticated and certified by PCGS as Proof 67 Deep Cameo and described as struck on a $50 Gold Planchet weighing 31.1 grams that was intended for a 1 oz Maple Leaf gold coin. 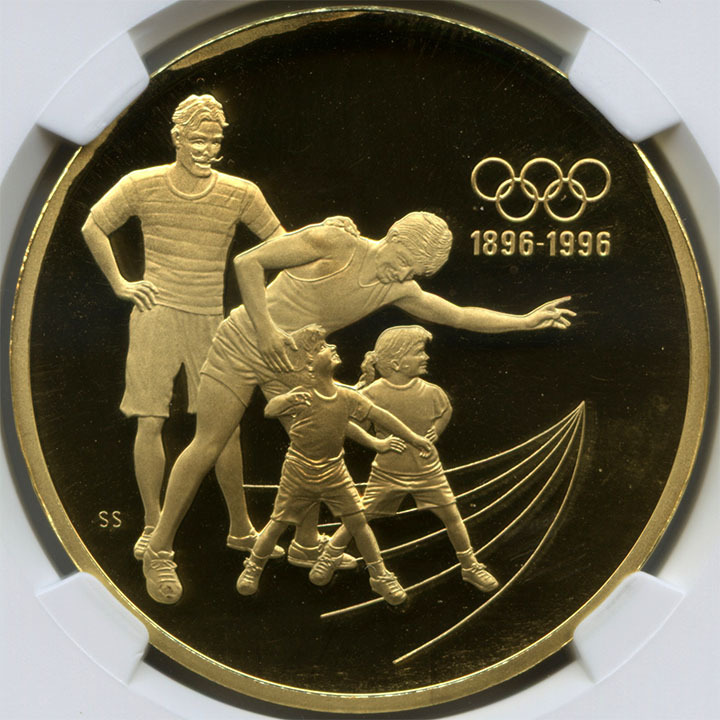 The other was authenticated and certified by NGC as Proof 68 Ultra Cameo Struck in Gold with a weight of 31.15 Grams. The International Olympic Committee decided to commemorate the centennial of the Olympic Games. In 1992 the Spirit of the Generations proof silver coin was issued by the Royal Canadian Mint and released in a special presentation box. These were struck with CITIUS ALTIUS FORTIUS on the edge. On September 15, 2003, the Royal Canadian Mint auctioned two different special gold strikings of silver commemorative coins. These were sold on eBay and made headline news in Canada since the Royal Canadian Mint had never released special gold strikings before. CBC News and other Canadian news outlets followed the auction and reported this story in their business sections. These two gold strikings were the size of a Kennedy Half Dollar and they sold for approximately $50,000 and $75,000 (U.S. Dollars). Andy Lustig was the successful high bidder and purchased both of these gold strikings on eBay. He subsequently sold them to a serious collector of unique numismatic rarities. 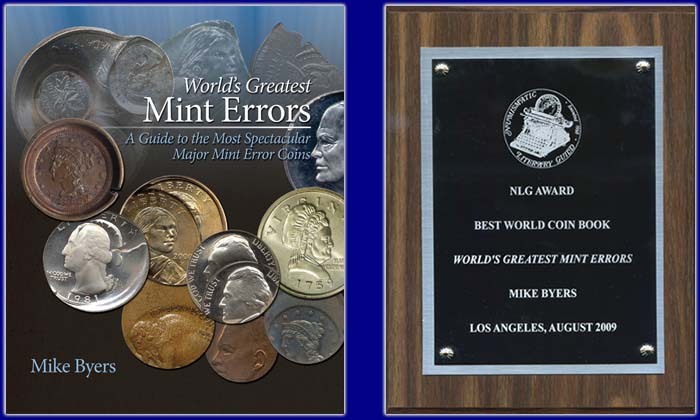 Andy Lustig is a well respected U.S. coin dealer and specializes in coins and patterns from the U.S. and around the world. 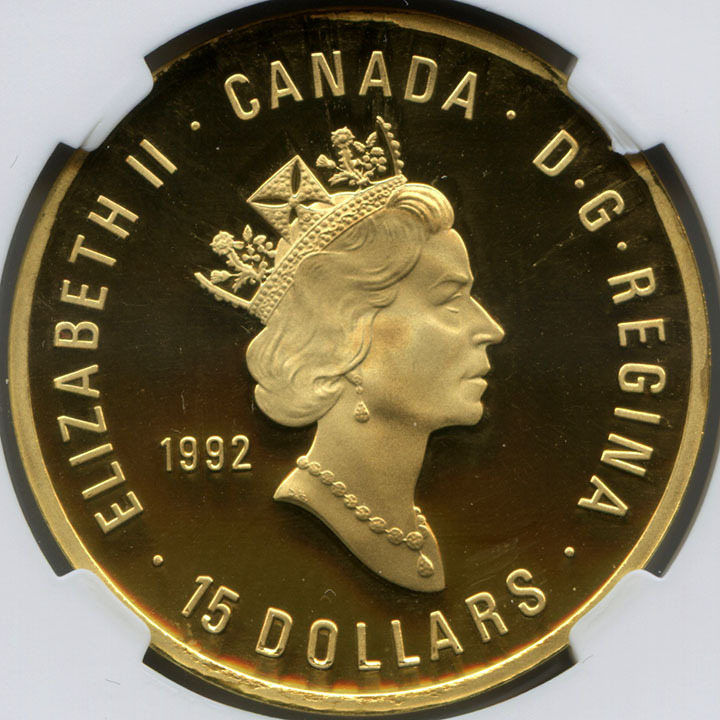 These 1992 $15 Canadian mint errors are twice the size of the two special gold strikings that sold on eBay. 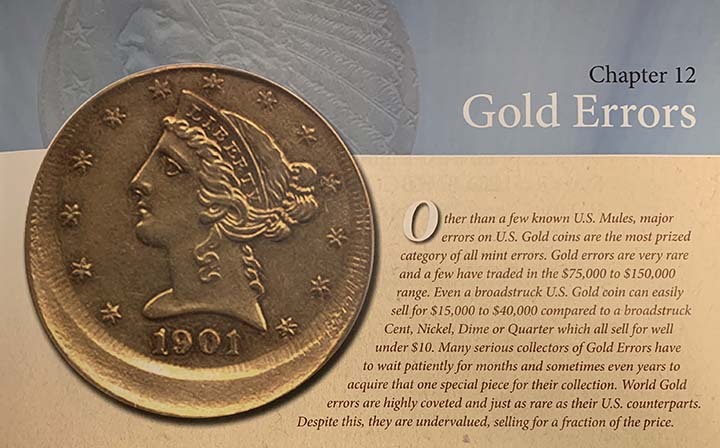 These proof gold off-metals rival any U.S. mint error coin. For comparison purposes, the U.S. Mint struck two commemorative Panama Pacific Silver Half Dollars in Gold. One recently sold in a Heritage Auction for $460,000. Also, several U.S. Indian Head Cents struck in gold on $2 1/2 Dollar blanks and certified by PCGS and NGC as mint errors have sold in public auctions from approximately $275,000, $250,000, $140,000 and $100,000. These amazing gold off-metals would be the centerpiece of any collection of Canadian mint error coins or commemorative issues.